One of my biggest complaints lately – and by lately I mean for like the past year and a half – is that I seem to be creatively blocked – stumped, stuck, clogged. The muse is constipated. I used to write creatively every day – all day, in a myriad of genres. And when I wasn’t writing? I’d draw (not that I’m good at it, but I enjoyed it). I’d be creative in the kitchen, too – baking breads and desserts and all sorts of new treats. But, ever since the divorce and my return to work, with the kids back in school, and dealing with life’s trials and tribulations, I haven’t been creative at all! I did have a few insightful moments over the last year when thoughts of love inspired poetic expression, and did come up with at least two articles I can think of off the top of my head that I was pretty proud of, but by and large, over-all, I’ve been creatively closed. This card says enough is enough… bust out the drano, grab hold of the plunger, employ the use of the roto-rooter, feed the muse her exlax and get on with the show. Card Meaning: Your heart needs an outlet to express powerful emotions. 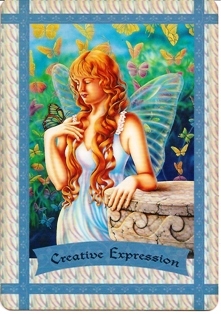 By drawing this card, you are urged to engage in an artistic or creative endeavor. Card Description: The fairies sing, dance, and make beautiful decorations as a way of expressing their heart’s joyful energy. You, too, are urged to create an outlet for creative expression. Anything artistic or creative will make your heart sing with joy, and will allow you to get in touch with your true inner feelings and divine guidance. Painting, flower arranging, photography, sand or snow sculpting, writing, or composing songs are wonderful examples. Your creative expression doesn’t need to be skillful or perfect. In fact, the most therapeutic types of creative activities allow you to “paint outside the lines.” In other words, don’t worry whether your creative project is perfect or marketable. Let go of all goals and judgments, and instead, create with childlike exuberance. Enjoy! Affirmation: I am a highly creative and artistic person. I now allow this side of myself to be expressed.